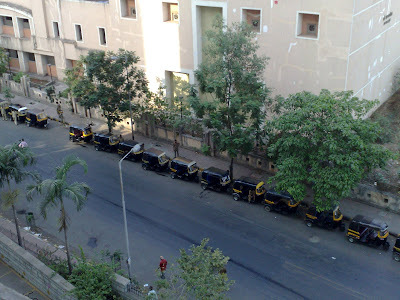 Mumbai is a busy city, a city that never sleeps! People are forever running up and down and the traffic is like the pulse of the city, forever throbbing. If you just step out of your home in Mumbai, you will be swept like the tide in the flow of this traffic and will be forced to keep pace with it. However, the traffic is never smooth as there are hundreds and thousands of traffic lights all over the city at various junctions. These traffic lights are meant to help regulate the flow of traffic through the maze of the roads in a smooth and efficient manner. Now, that might have been possible, if it weren't for the traffic cops who are stationed in some of the most busiest intersections who make it a point to create more chaos. They are much more interested in making a fast buck out of errant drivers, traffic violators, and taking their daily or weekly bribes from the truck drivers and auto drivers, than making sure that the traffic flows smoothly and that there shouldn't be a jam. But you can be sure that if there is a traffic jam somewhere...there has to be a traffic cop near it! 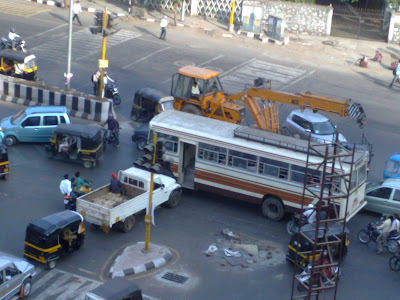 Busy intersection where six roads meet and the traffic lights don't work in Thane. Having staying in Mumbai for quite a few years now, I have got used to this scenario. In fact, this happens not only in Mumbai, but all over India. Go to any city, or place...the result is the same. Traffic jam means there is a traffic cop close by. Had there been no cop, things would have probably moved in a faster pace. I wonder what these traffic cops are taught? Do they really know how to deal with traffic problems? Anyway, so stating the above, I was surprised to see this particular junction (as seen in the picture above) which is equally busy throughout the day, and has six roads meeting it, with traffic lights that don't work, and NO traffic cop to supervise the traffic either. 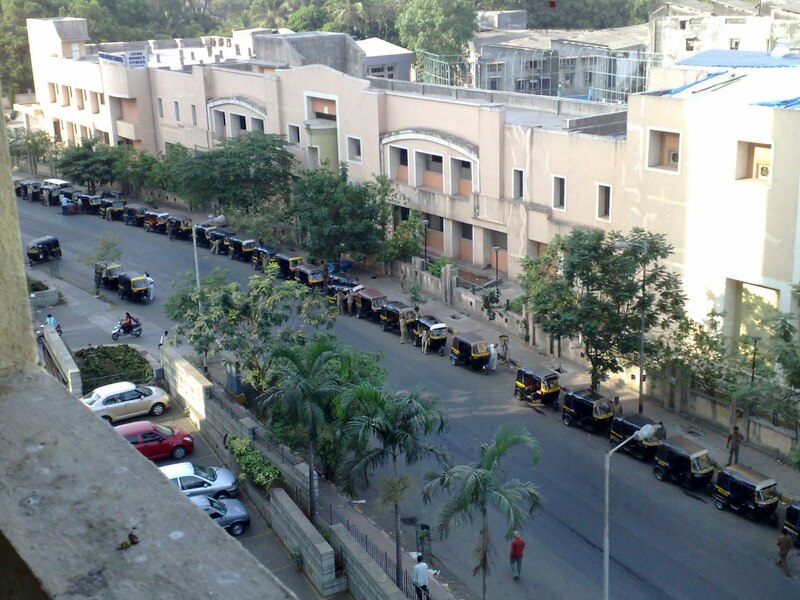 This road is right in front of the building where I stay in Thane. 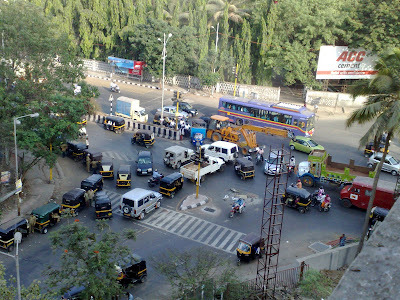 And what is interesting to observe about this junction is that the traffic never gets jammed here. 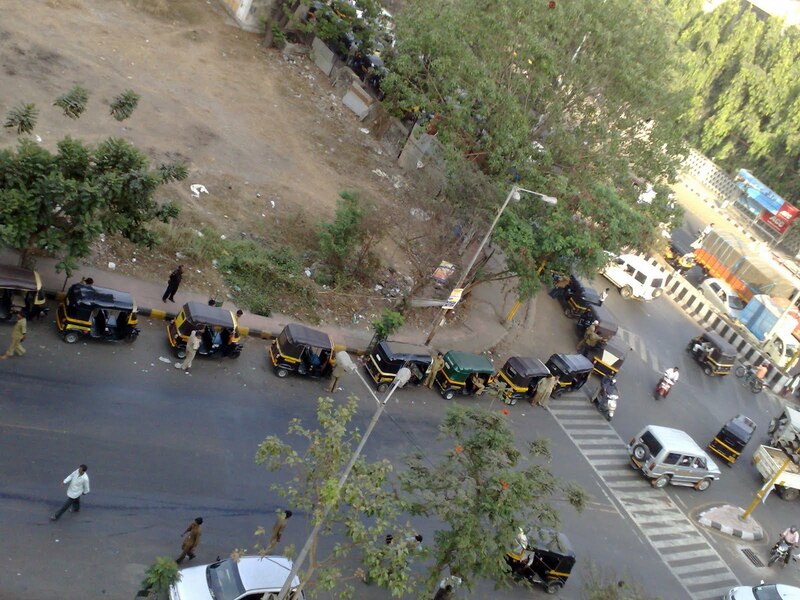 Yes, the traffic continues to flow smoothly without any interference from cops or any other source whatsoever. As you can see, the traffic moves in all directions here, including a "U" Turn and the vehicles often break lots of traffic rules here, even going on the wrong side of the road. But..the traffic never stops. The vehicles, as you can observe in the picture, are moving straight ahead, taking a "U" Turn at the junction, or turning right, there is oncoming traffic from the road on the right as well that either goes right or straight ahead to join the road in front, and traffic coming from the opposite side, that will either go straight or take "U" turn...So, traffic in all directions possible! In addition, there is also a long line of Auto Rickshaws queued up for CNG at the nearby petrol pump that stretches all along the road, way back! See the subsequent pictures of this queue! Fascinating. To add to the obstacles in this junction is a manhole which at times is gaping open, and times dug up and filled temporarily hampering the traffic coming from the opposite side or turning into this road. And then there are the rains, which cause this road to fill up with water. But, in spite of all this, the traffic still manages to surge throughout the day, without any major hangups or problems...I am amazed and fascinated by this sight on a daily basis. So, what happens when traffic lights don't work, and there are no cops nearby? The result is here for all to see. 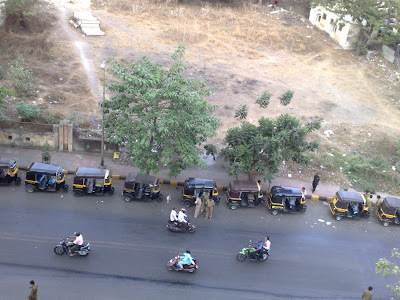 A living proof and example of how Mumbai can manage quite well without interference from the civic authorities who do nothing other than harass the public at large, by abusing their power and being corrupt. A point to be mentioned here, is that just ahead of this junction, there is the main junction where there are a hoard of traffic cops sitting and where the traffic lights are working just fine. Why do you need cops there? Anyway, a picture speaks for itself...! See for yourself.